The Hope of Christmas in an Hour of Oppression. 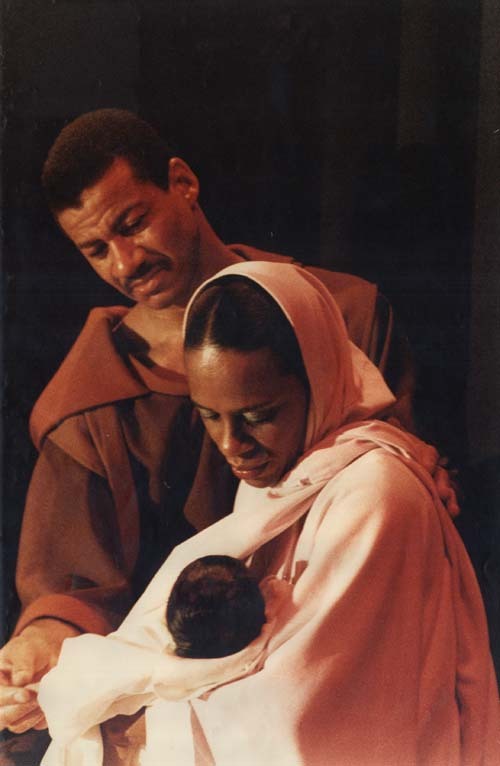 The story of Mary, Joseph, and the newborn Christ deserves graver contemplation this year. As Christmas nears, I am remembering not the miracle of the virgin birth, nor the pageantry of an angelic announcement. Not the damp stench of dung in the manger, nor the frankincense and myrrh that staved that stench from the newborn Christ’s skin. Days before the holiday, I am remembering Herod the Great. He has come to the fore of my Christmas contemplation, because we have too often overlooked his part of the narrative. This is a time to revere a messiah, but it is also a moment to mourn the massacre that followed his arrival. This year, cruelty has been charging forth, unpenned, throughout cities across the nation. As our annual gift-shopping frenzy ensues, protesters are pretending to be dead in the halls of commerce; they are splaying themselves on unyielding concrete, channeling ill-fated ends. Children are raising “Am I next?” signs over their heads when black citizens die unjustly at the hands of police. And now, unions of officers may be seeking street retribution for the killing of two of their own. Now, they are declaring war on communities they once swore to serve and protect. Now, they are equating the shooting of unarmed children with the possibility of death in the line of duty, as though the latter is not a known and accepted hazard of their chosen profession. It is fitting, then, to recall the cruelty of King Herod during this holiday season, as carols seem inadequate and shopping is more an act meant to numb than to heal. This year, the wintry air, which often feels more fit to breathe when it’s this icy and crisp, is oppressive instead, as we chant reminders that breath, for some, is no longer regarded as a unilateral right but a luxury. I am thinking of what happened after word reached King Herod that a new heir had been born, one without earthly father or the scourge of human sin. I am thinking of the soldiers the king sent forth wielding swords, all the mothers whose sons were ripped from their arms as they cooed, boy-children beheaded before their eyes. This is a message. This is a message. This is the message: There will be no savior. Your plea for mercy will go unheard. The lives of your children do not matter. Herod meant only to protect the institutions he’d raised. He wanted to preserve his own rule. If it meant the bloodshed of every child with the potential to grow up and challenge his authority, he reasoned, it was a small price to pay to keep his peace. I am thinking of those who would run, Mary and Joseph among them, fleeing in time for the census, back to a place where they believed they could keep their newborn safe, a place where his birth would be counted, a place where his life would matter. And there were, in fact, serene years. Years their son Jesus spent in prayer and in study at temples, years of learning a meaningful trade, years of wedding feasts and thousands of unthreatened births. These are the years on which we meditate when Christmastime is nigh. But there has always been a pall cast over my heart as I regard the infant in his swaddling clothes; for Easter will also come, and with it, the annual reminder that our Christ was kept safe for over 30 years just to die at the hands of a government as treacherous as Herod the Great’s. When we celebrate the promise of salvation rushing forth into the world, we do it with full understanding that salvation is not an unbloody enterprise. This is the time of year when we commemorate the emergence of promise in a desolate time, hope in an hour of intense oppression, faith that must be guarded amid palpable terror. At no other moment in recent memory has this nuanced facet of our celebration been as relevant as now. The symbol of our belief knew well this tension, this peril. He knew what it was to have parents who feared for his safety whenever he left home, who warned him of how best to interact with authority in order to preserve his life. Of course, our Lord was not here for self-preservation. He came not to bring peace, but a snare. He came to die. This Christmas, we must remind one another that the emergence of a savior is not the end of the story. It is the beginning of terror for the mothers of countless firstborn sons. It marks an era of martyrdom, both witting and unwitting. But it is also when we ask the most essential questions. Why do we continue to believe? How do we continue? I cannot speak for anyone else, and even my own answers vary year upon year. Today, I believe because there are far more people patterning themselves after Herod than after Jesus. There is far more tangible evidence of terror than of salvation. And this is all the more reason for me to hold fast to the hope that I am not here alone. I am not fleeing to a land that does not exist. I am not praying for the safety of a black child whose ill fate is already sealed. There is still the hosanna to sing. There is still breath to declare a glory as yet unseen. There is still someone waiting in the celestial wings, with knowledge of a world yet to come. I believe because this — the deaths of Tamir and of Eric and of Dontre, the deaths of Rekia and Tanesha, of Ramos and Liu — is not the first massacre of innocents. It will not be the last. And still, each year: tidings of great joy. I believe because these words, recited, return to us each December, even as so many of those we love do not. I believe because there is comfort in their recitation, in the tradition of their endurance. Something else is coming, something that succeeds us all. For a moment, this stills my trembling. For a day, I welcome all that we will never understand. There is a sign at the sight of Thee. There is none beside Thee. This year has been a reckoning, a humbling. Each day and every breath, a reminder of your mercy and our own mortality. This year, we have lived our own Massacre of Innocents. In advance of this holiday, we were informed anew of the cruelty inhabiting Earth and of the compassion it will take to overcome it. In every telling of your origin story, the most improbable point for me has been that a king would slaughter many in an effort to obliterate one, that a man of great might could feel so strangely threatened by children. I need no longer imagine. This year, You have been a sickle, gathering unto Yourself those we’ve loved. Though we know there is no better place for them than with you, exulting in this has not been easy. Even as we commemorate God’s infinite love made manifest in You, we, like the parents of Bethlehem, are haunted by loss. It is our charge, then, as this trying year begins to finally recede, to restore our faith in the Incarnation, to reclaim whatever wonder has slipped from our grasp. The beauty of your birth must never be blotted by our sorrow. That You have come to us and that You continually pine for the renewal of our faith are gifts whose value cannot be measured. That You are able, morning by morning, to transmute our misery and usher in the kind of love we could no longer imagine, is the reason we rise each year on this holiday and proclaim you holy. You are what we cannot be. Jesus works a series of doubles at the only checkout counter that’s ever open, the one where the flickering globular light overhead seems ever in need of repair. Jesus is just over six feet tall, making the long, burgundy, pocketed smock he wears seem prominent and absurd. The smock is unmarked, as are the paper and plastic bags hanging from a revolving corral no higher than his hip, nameless, as is the off-white awning that arches over the entrance. Under the smock, he is customarily clad in jeans, fraying at the hems, and a white linen shirt with loose stitching. He seems to have a vast array of white linen shirts with loose stitching. His hair, a thick, dusky mass of loose curls about six inches long, is held away from his olive-skinned face by an athletic sweatband. He has the kind of toes one would imagine, long and slender, with sand in the crevices of the nail beds. His footwear tends to vary, within the narrow range of huaraches and flip-flops and Birks. His eyes are an unremarkable brown, but his lips are exquisitely full. He has the nimble, four-inch fingers of a basketball player and Nine has grown to love watching him, as he keys in esoteric codes on the cash register touch screen. Today is like the others. She, untethered from the trappings of consciousness, finds herself unceremoniously present with no recollection of arrival. Soon, she will materialize in some other holding cell, perhaps among an unusually vivid array of memories or in a dark corridor amplified with self-narration. And when she does leave Jesus’s curious company, it’s unlikely she’ll recall how she exited. Until then, here she is, wanly pushing her empty cart, allowing herself to be zigged about by its rickety front wheels. Jesus spritzes the conveyor belt with Windex before pushing a cloth in circular patterns across it. After watching it streaklessly dry, he folds the damp cloth and tosses it into a bin below the counter. Like ivy along old brick, an inexorable pity creeps all over Nine. “This store is a front, isn’t it,” she whispers, more to herself than to Jesus, who chooses to ignore her, as is sometimes his wont. He leans against the cash drawer, slinging one long leg in front of the other before folding his arms over his broad chest and lifting his wrist to aim the tiny remote control in his hand at the black and white surveillance monitors dangling over the automatic sliding doors. It must be awful, Nine muses, to have to hang out in the abandoned recesses of someone else’s body, waiting for decisions to be made. She watches Jesus yawn, and there’s something endearing about the oval his lips form and the satisfied little sigh that escapes his throat. He’s as stuck here as she is.